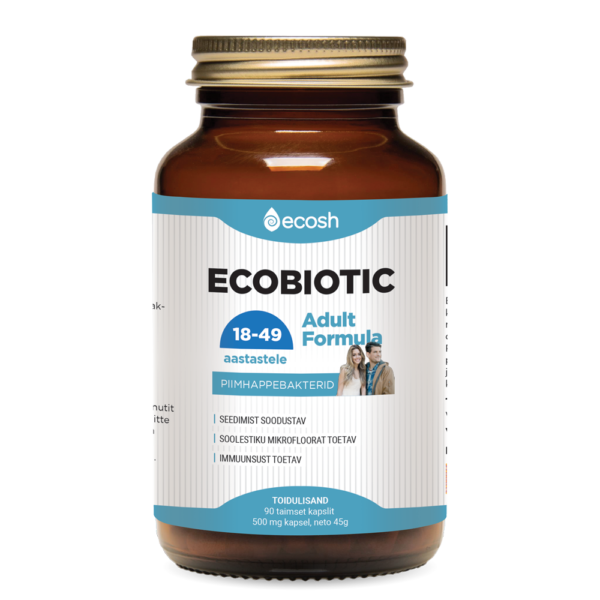 EcoBiotic Adult Formula probiotic lactic acid bacteria inhibit the toxic effects of pathogenic bacteria and yeasts and restore the balance of the intestinal microflora. Probiotics actively participate in nutrient breakdown and absorption. if you suffer from intestinal dysbacteriosis. The daily dose of EcoBiotic contains nearly 20 billion lactic acid bacteria, which is sufficient to increase the concentration of the so-called “beneficial” bacteria in the body. Probiotic lactic acid bacteria normalize digestion and digestive tract function, inhibit the activity of pathogenic microbes, protect the body from the toxic residues they produce, and prevent metabolic disorders. Taking lactic acid bacteria after antibiotic therapy helps to balance intestinal microflora and improve the body’s defenses. Taking additional beneficial bacteria in the form of probiotics helps to maintain good health. EcoBiotic Adult Formula (18–49), 4 most important bacterial strains, daily dose contains 20 billion bacteria. EcoBiotic Adult Formula: lactic acid bacteria: Lactobacillus acidophilus, Lactobacillus rhamnosus, Lactobacillus casei, Bifidobacterium bifidum, bulking agent: microcrystalline cellulose, organic inulin, vegetable capsule (hydroxypropyl methylcellulose). Directions: It is recommended to take 1–2 capsules a day or according to the recommendation of a therapist or a physician. Capsules should be taken with water in the morning on an empty stomach or before going to bed, 30 minutes before or after a meal. Recommended administration period: in courses or as needed throughout the year.